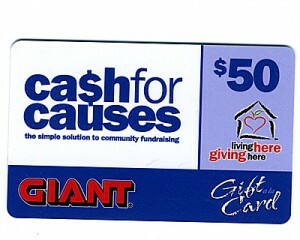 Cash for Causes is a program offered by GIANT to help not-for-profit organizations achieve their fundraiser goal. • Our church purchases GIANT Living Here Giving Here gift cards at a 5% discount. • The church resells the gift cards for the full value dollar amount of $50 or $100 to anyone that would like to use them to purchase groceries or gas at any GIANT or MARTIN’S food store. This creates a 5% profit on every gift card purchased. Proceeds will go towards missions. Hosted By: CTI Networks, Inc.